Nuance's Dragon Mobile Assistant app for Android has just received a big update, including a Driver Mode that automatically starts listening for voice commands and reading notifications when you're behind the wheel. Driver Mode is supposed to prevent you from ever having to touch your phone in the car. 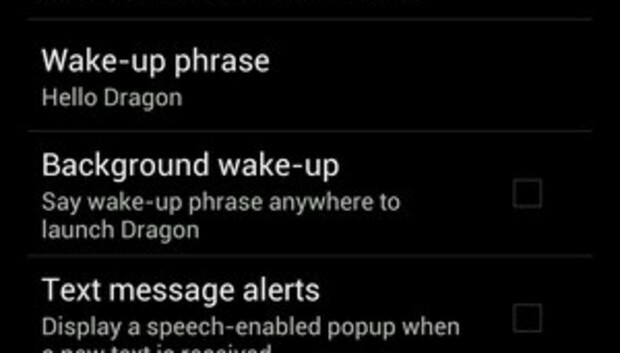 Instead of fiddling with buttons, you can simply say "Hello Dragon" to begin a voice command. Driver Mode can be set to turn on automatically when your phone connects to the car's Bluetooth system, docking station, or by audio cable. In theory, Dragon can also turn on Driver Mode when the car starts moving by detecting the phone's GPS location. The motion detection feature is most interesting, because many cars still don't have built in Bluetooth or a docking station for Android phones. However, I didn't have much luck getting this feature to work properly. While driving around my neighborhood with GPS tracking and motion detection enabled, Dragon's Driver Mode never activated on its own. Strangely, background voice detection did engage on occasion when I opened the Dragon app, but I couldn't reliably duplicate this occurrence. Besides, having to open the app defeats the purpose of automatic voice detection. It doesn't help that Dragon's settings menu for Driver Mode is confusing. Under Driver Mode settings, there are options to turn on background voice detection and read aloud notifications. However, these are actually options to permanently turn on these features, whether you're driving or not. Their placement within Dragon's settings menu is misleading. To make things worse, turning on voice detection and read aloud notifications can be a big battery drain, and caused my HTC One to become hot. Also, each of these features, when enabled, create a persistent icon and line on the Android notification bar. The good news us that if you have one of the other connection methods available, Dragon's Driver Mode works much more reliably. When I plugged in an audio cable, voice detection and read out notifications both switched on immediately, and they turned off as soon as I unplugged the cable. And thanks to the new update, you can now have Facebook notifications read aloud to you while you drive, and can dictate entire emails. With a Bluetooth connection, docking station or audio cable, Dragon's new Driver Mode can be a handy hands-free solution for Android phones. Just don't expect the driving detection to work nearly as well.